TheBlackjackRules.com. Casino Counter Measures Against the Card Counters to Know. "Be sure they will find you and catch you up." How many times have you heard that? But still you train your card counting skills, consult tons of educational materials, and have wheels in your head caused by unstopping counting procedures. Cause it's helpful and easy, profitable and stylish - card counting method. The best and shortest way to perform blackjack card game successfully. And why do they ban such a favorable way for you to win?.. 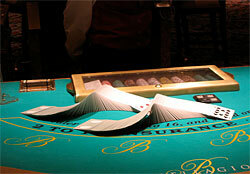 Card counting systems usage is a very popular trend among the gamblers. This fact caused by lots of educational literature, with tips and guidelines, available for a player to find, buy and master. Plus the thirst for easy money is a very seductive issue for any person lives this planet. Thus we have the confrontation between the house interests and players who cheat (IAE). "You can't break the casino ever." It's the golden rule of the gambling world which nevertheless has the pleasant exceptions. So how do casinos stand against these exceptions and what counter measures do they possess? In-house card count procedure implies the automated systems used by casinos to possess their own count of cards in the deck. Simultaneously the mechanism tracks the player bet sizes. Thus if the deck is hot and the player systematically raises his wagers, or vice versa the player lowers his bets when the system signals the negative count of the deck - then the player may be suspected in cheating. If the information will be confirmed - the player is asked to leave the building at once. The next HT device deals with a rather expensive tip - the microchips inside the gambling chips. Thus the casinos follow the betting amounts of each casino table. It sounds a little bit fantastic, but you may be sure the most well-known and wealthy gambling houses own such equipment no doubt. And even more than this. Facial recognition draws a line of casino counter measures and speaks for itself indeed. The special cameras scan all the casino visitors entering the building, check with the face database the house possesses. As we see the casinos have at their disposal lots of counter measures to find you and cut you down. So be watchful if you dare to play tags with the house. And be ready your life will remind you of ultimate survival series.